There are many different ways library users can benefit from Computing Reviews. Materials for libraries are designed to help your users become aware of Computing Reviews and gain a better understanding of its functionality. To find out more about these materials, or to order any of the items below, please contact our Marketing Department at marketing@computingreviews.com. Click on any link on this page to download the PDF for immediate use. You can download the PDFs of our posters and print them in any size you wish, or you can order the red spheres poster sized 13×17.5 inches from us. 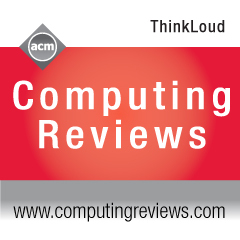 There are six tip sheets that help users get the most out of Computing Reviews. The Quickstart is a general introduction, and the other four deal with specific features of the CR site. You can download the PDFs, email them to users, and print them out. We also have printed versions of these tip sheets, and you can order those from our Marketing Department. An effective way of introducing your community to Computing Reviews is by email. During a trial or launch, you can send out the following emails. Simply, download the word document and paste the text into the email, then attach the appropriate PDF. The Questionnaire allows users to give their feedback at the end of a trial. Use a banner or badge image to create a link to Computing Reviews from your website. To save an image to your computer, right click on the image and "Save Picture As..."
We have two flyers that can be distributed at the library and the Computer Science Department. One announces a trial, the other lets users know that they have access to CR via a subscription. The subscription flyer can be customized to include your institution's name. This change can be made in Microsoft Word or Adobe Acrobat. These ads are scaled for print publications and can be placed in your institution's publications. The Americas and Europe/Asia ads can be printed in color or black and white, while the ad with the spheres is only available in color. Intended for an 8.5 x 11 inch page, the ads can be scaled up or down to fit other page sizes.